Efforts to develop fully autonomous self-driving cars have continued to close the gap over the past few years, and now ARM has unveiled its first chip designed specifically for the task. The company's technology already powers many mobile devices, IoT and is in cars today, but this Cortex-A76AE (Automotive Enhanced) chip combines the high power and efficiency we're used to in smartphones with "Split-Lock" tech focus on safety. If one of these chips is processing the code that drives your car, a crash would be disastrous, which is why the DynamIQ multi-core processing we've seen used to boost AI recently is being paired with Split-Lock. Now you have a fast 64-bit processor that can switch between modes, with the "Lock" ability running identical code on two cores for safety and checking, or "Split" where different cores can deal with different tasks. There's even support for an additional CPU core that can act as a "Safety Island" checking the other outputs for redundancy, with the ability to disable some and run in a lower-speed mode if any problems are detected. With all the information flowing through the processor of an autonomous car, getting both performance and reliability -- while maintaining efficiency, which ARM claims can measure at 250K DMIPS at less than 15 Watts -- out of the 7nm hardware will be key. As far as competition, look no further than Intel & Mobileye. 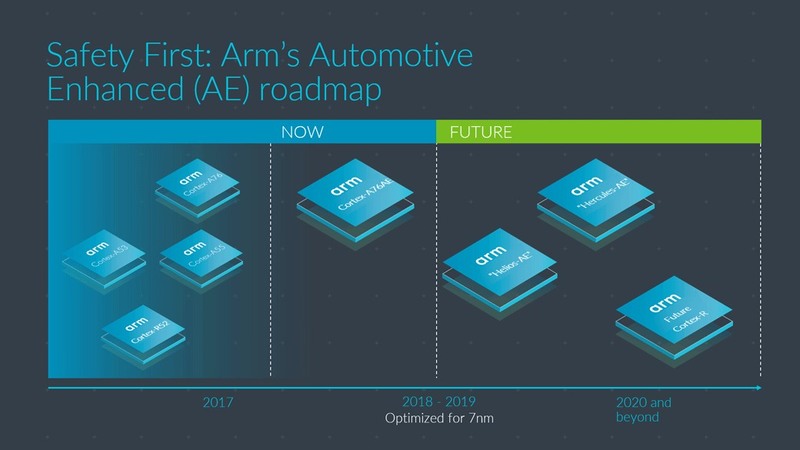 ARM's roadmap for these AE chips extends to 2020 and beyond, and it's likely that a self-driving car you see on the road on the future will have something relying on the design inside of it.